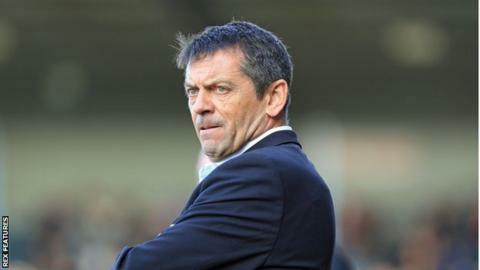 Southend United boss Phil Brown was left bemoaning his side's lack of attacking quality after defeat at relegation-threatened Blackpool all but ended their League One play-off push. Saturday's 2-0 loss at Bloomfield Road left the Shrimpers eight points outside the play-offs with six games remaining. "I can't fault the effort, what I can fault is the quality in the final third," Brown told BBC Essex. "When you step up a division you need to step up your quality." Second-half goals from Blackpool's Mark Cullen and Jacob Blyth means Brown's men have won just one of their last four games - last Wednesday's 3-1 victory over Sheffield United. "We asked questions but they weren't serious questions," Brown added. "Consequently we've come away with nothing. You can hear the disappointment in my voice. "I don't play mind games. I really thought two games ago it (the play-offs) was off and one game ago it was on again."